BrainBOK Quiz runs on our proprietary quiz engine which has built-in intelligence. It uses content from the ITTO Explorer and turns it into surprisingly challenging and unique questions on-the-fly. Quiz can be taken by Processes, ITTO, or Data Flow between processes, with an option to limit the questions to a specific Knowledge Area. The Glossary quiz comes as a bonus. Learn PMBOK® Guide ITTO and Glossary terms using multi-dimensional quizzes generated by an automated quiz engine from a pool of 49 processes and 1452 ITTO, yielding thousands of unique permutations and combinations. 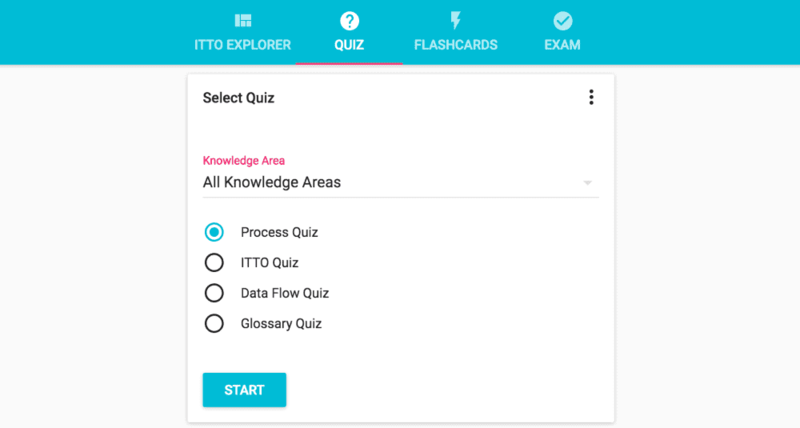 The Process, ITTO and Data Flow quizzes are integrated with the ITTO Explorer. Along with the correct answer, the ITTO Explorer grids are displayed below the correct answer for quick verification and reinforcement. Know your strengths and weaknesses by Process Groups and Knowledge Areas using simple, interactive and easy to understand graphs and charts. The key difference between the Quiz and the Exam module is that questions on the Exam are set in advance by our PMP®-certified experts, whereas the questions on the Quiz are generated on-the-fly by our quiz engine. The unique questions on our Exam module are limited to the size of the question pool, whereas the unique questions on the Quiz are practically unlimited. Read the next section to learn more. The number of unique questions on the quiz is practically unlimited. The questions in the quiz are generated randomly by the quiz engine. With 49 project management processes and their 1452 ITTOs combined with random ordering of the answer choices, and switching between right / wrong choice formats, the total number of permutations and combinations is huge. You may never see the exact same question (with the same answer choices in the same order) repeat during your practice if you go with the "All Knowledge Areas" option. Yes. However, we recommend against using this option because it drastically reduces the effectiveness of the tool. When you take a quiz by a specific Knowledge Area, the quiz engine has a very limited set of data to work with. This in turn limits the number of unique questions that it can generate. You'll start to see the questions repeat very soon. Ultimately, it will lead to memorizing the answers, which will skew your scores and give you a false indication of your preparedness. We strongly recommend that you always use the default option "All Knowledge Areas" when taking the quiz. Practically unlimited. The questions in the quiz are generated randomly by the system. With 49 project management processes, 1452 ITTOs, and random ordering of the answer choices, the total permutations and combinations for the quiz questions are practically unlimited. If you use the 'All Knowledge Areas' option, you may never ever see the exact same question (with the exact same answer choices in the exact same order) repeat during your practice. Tip - Practice makes Perfect! Some quizzes are only available with paid subscription. If you have a Basic membership, you can only access limited content in the system. Please consider upgrading to Premium membership to enjoy unlimited and unrestricted access to all the quiz features. Well, that's our trade secret, our secret sauce :) We have built-in intelligence in the quiz to make the questions more challenging. Tip: Try to review the ITTO Secrets (in the ITTO Explorer module) to know why a particular ITTO is an ITTO for a process. That will help you understand the ITTOs, and hopefully you won't need to memorize them! The All-time and Current Session scores would be same initially until you click the 'Reset Session' button, which is available on the Quiz Performance Report. Let us understand what Session means. Session doesn't mean each round of quiz questions, which you attempt. Session is controlled by you, the user. The Current Session would continue until you go to the Score Report and click the 'Reset Session' button at the top of the report. Once you reset your score, your current session would expire and a new session would start. Your Current Session scores would be reset to 0, but your All-time score would remain intact. The system doesn't allow you to reset the All-time score. Now let us consider an example to understand this better. Let's say you start taking the Quiz on Jan 1. You take a few questions every day from Jan 1 - 15. Until Jan 15, your All-time score and the Current Session score would be the same. On Jan 16, you click on 'Reset Session'. That would end your previous session, start a new session and reset your Current Session score to 0. From that point onward, your All-time score and Current Session score would be different. Your new session (started on Jan 16) would remain valid until you click 'Reset Session' again. The idea of 'Reset Session' button is to give more control to the users. The users decide how long their session is. Users can use this option to track their performance over an extended period of time. Your session could be 1 hour, 1 day, 1 week, 1 month or even longer in duration. You can Reset the session whenever you want. The same (or similar) questions may repeat if you take the quiz by Knowledge Area. Questions in the quiz are generated automatically from the ITTOs. If the Knowledge Area has relatively fewer processes, the chances of a question repeating would be much higher because the system would have fewer options to select from. We DO NOT recommend taking the quiz by Knowledge Area at all. The quiz by Knowledge Area feature was added due to popular demand from our students, but we believe that it reduces the effectiveness of our tool. If you take the quiz from All Knowledge Areas, the chances of the same question repeating are extremely slim for the reason explained above. The Quiz module is fundamentally different from the Exam module in BrainBOK. The questions in the quiz are generated on-the-fly by our quiz engine using our secret sauce, which makes the questions realistic and challenging. The quiz questions are based on the Project Management Process ITTOs and Glossary terms only. On the other hand, questions on the Exam are preset by our experts according to the PMP / CAPM Exam Content Outline set forth by PMI. System keeps track of and displays the quiz score right at the bottom of the quiz form after each question. Apart from that, you can track your performance using detailed Domain-wise (graphical) Reports option on the Quiz tab. The reports show the All-time performance as well as the performance for the Current Session. The Quiz and the Exam modules are fundamentally different. Quiz module is 100% automated with built-in intelligence and all the quiz questions are randomly generated by the Quiz engine (software). Whereas, the questions in the Exam module are developed by our subject matter experts (humans). The Quiz module does not include real exam-type questions. The real exam-type questions are available on the Exam module. With 47 processes and 618 ITTOs, the Quiz module can generate virtually unlimited number of unique questions. Whereas, the number of unique questions on the Exam module are limited (1000 for PMP and 800 for CAPM).